William F. Witzel was born on 1 May 1874 at Wisconsin. He was the son of John Henry Jacob Witzel and Amelia Morsback. William F. Witzel married Della C. Nafus, daughter of Robert C. Nafus and Serepta E. Rains, circa 1902. William F. Witzel died on 24 January 1943 at Nowata, Hickory, Oklahoma, at age 68. [S246] U.S. Federal Census 1880 U.S. Federal Census, by Ancestry.com, NA Film Number T9-1446 Page Number 233A. [S245] U.S. Federal Census 1900 U.S. Federal Census, by Ancestry.com, ED145. Dwelling 46. [S244] U.S. Federal Census 1910 U.S. Federal Census, by Ancestry.com, Year: 1910; Census Place: Monona, Clayton, Iowa; Roll: T624_397; Page: 12A; Enumeration District: 0070; Image: 1031; FHL Number: 1374410. [S243] U.S. Federal Census 1920 U.S. Federal Census, by Ancestry.com, Year: 1920;Census Place: Hickory, Nowata, Oklahoma; Roll: T625_1478; Page: 3A; Enumeration District: 65; Image: 348. [S250] U.S. Federal Census 1930 U.S. Federal Census, by Ancestry.com, Year: 1930; Census Place: Wann, Nowata, Oklahoma; Roll: 1916; Page: 2A; Enumeration District: 16; Image: 1107.0. Married Name 12 September 1902 As of 12 September 1902,her married name was Dewey. Lydia B. Witzel was born in December 1876 at Wisconsin. She was the daughter of John Henry Jacob Witzel and Amelia Morsback. Lydia B. Witzel married George F. Dewey, son of Benjamin Franklin Dewey and Elizabeth B. Carpenter, on 12 September 1902 at Spring Green, Sauk, Wisconsin. Lydia B. Witzel died after April 1930. Lydia B. Witzel had zero children. [S244] U.S. Federal Census 1910 U.S. Federal Census, by Ancestry.com, ED107. Dwelling 463. [S250] U.S. Federal Census 1930 U.S. Federal Census, by Ancestry.com, ED63. Dwelling 455. Name Variation Franklin Ulrich Witzel was also known as Frank. Name Variation Franklin Ulrich Witzel was also known as Francis. Franklin Ulrich Witzel was born on 11 September 1879 at Spring Green, Sauk, Wisconsin. Franklin Ulrich Witzel married Dora Frances Hemenway, daughter of (?) Hemenway and Emily E. (? ), on 14 June 1902. Franklin Ulrich Witzel died on 20 May 1924 at Mosca, Colorado, at age 44. [S244] U.S. Federal Census 1910 U.S. Federal Census, by Ancestry.com, Year: 1910; Census Place: Township 4, Stanley, South Dakota; Roll: T624_1488; Page: 19B; Enumeration District: 0106; Image: 840; FHL Number: 1375501. [S243] U.S. Federal Census 1920 U.S. Federal Census, by Ancestry.com, Year: 1920;Census Place: Creighton, Maricopa, Arizona; Roll: T625_48; Page: 6A; Enumeration District: 34; Image: 1098. James Alexander Trimble married Maria Rebekah Cruse Young, daughter of Franklin Young. James Alexander Trimble was born on 14 November 1834 at Livingston, Kentucky. [S246] U.S. Federal Census 1880 U.S. Federal Census, by Ancestry.com, NA Film Number T9-0429 Page Number 369C. Name Variation Maria Rebekah Cruse Young was also known as Mariah. Married Name Her married name was Trimble. Maria Rebekah Cruse Young married James Alexander Trimble. Maria Rebekah Cruse Young was born on 14 May 1849 at Livingston, Kentucky. She was the daughter of Franklin Young. Warren Millage was born on 7 October 1842 at Owego, Tioga, New York. He was the son of Joseph Millage and Katherine Kramer. Warren Millage married Martha Jane Buchanan on 28 August 1866. Warren Millage married Hattie Clara Wimer on 25 October 1893. Warren Millage died on 14 August 1923 at Canton, Lincoln, South Dakota, at age 80. Circa 1863 at Iowa Name: Warren Millage Side: Union Regiment State/Origin: Iowa Regiment Name: 31 Iowa Infantry Regiment Name Expanded: 31st Regiment, Iowa Infantry Company: D.
[S247] U.S. Federal Census 1870 U.S. Federal Census, by Ancestry.com, Page 2. Dwelling 10. [S246] U.S. Federal Census 1880 U.S. Federal Census, by Ancestry.com, Family History Library Film 1254113 Page Number 359A. Married Name 28 August 1866 As of 28 August 1866,her married name was Millage. Martha Jane Buchanan was born in 1848 at Pensylvania. She married Warren Millage, son of Joseph Millage and Katherine Kramer, on 28 August 1866. Martha Jane Buchanan died on 9 June 1893 at Canton, South Dakota. Roy Earl Millage was born on 31 March 1874 at Sioux City, Iowa. He was the son of Warren Millage and Martha Jane Buchanan. Roy Earl Millage married Minnie M. Goss on 10 November 1897 at Canton, South Dakota. Roy Earl Millage died on 21 October 1953 at Canton, Lincoln, South Dakota, at age 79 also reported as 02 Oct 1953. Married Name 10 November 1897 As of 10 November 1897,her married name was Millage. Minnie M. Goss was born on 2 June 1874 at Lllanmark, Illinois. She married Roy Earl Millage, son of Warren Millage and Martha Jane Buchanan, on 10 November 1897 at Canton, South Dakota. Minnie M. Goss died on 8 November 1958 at age 84. He was the son of Roy Earl Millage and Minnie M. Goss. 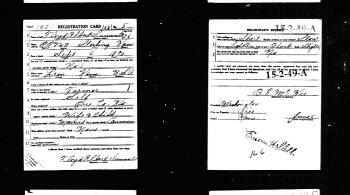 [S9] South Dakota, South Dakota Birth Records South Dakota, State File Number: 627451 (unknown file date). Name Variation Stephen Edward Jackett was also known as Ed. Stephen Edward Jackett was born on 26 March 1896 at Madison, Dane, Wisconsin. He was the son of John Jackett and Matilda Larkin. Stephen Edward Jackett married Lillian Isabel Bowell, daughter of George Edwin Bowell and Amity Louise Stryker, on 18 April 1917 at Bear Creek, Sauk, Wisconsin. Stephen Edward Jackett died on 23 September 1937 at Richland Center, Richland, Wisconsin, at age 41. Name Variation Lyle Gordon Bowell was also known as Gordon. Lyle Gordon Bowell was born on 14 March 1912 at Richland Center, Richland, Wisconsin. He was the son of George Edwin Bowell and Amity Louise Stryker. Lyle Gordon Bowell died on 30 October 1990 at age 78. Lyle Gordon Bowell obtained US Social Security Card at Wisconsin; last residence not specified. [S243] U.S. Federal Census 1920 U.S. Federal Census, by Ancestry.com, ED160. Dwelling 125. [S250] U.S. Federal Census 1930 U.S. Federal Census, by Ancestry.com, ED8. Dwelling 1. Dorothy Ann Bowell was born on 27 October 1916 at Richland Center, Richland, Wisconsin. She was the daughter of George Edwin Bowell and Amity Louise Stryker. Dorothy Ann Bowell died on 10 April 2001 at age 84. Frank Klekoski was born on 27 March 1874 at Germany. He was the son of John Klekoski and Annie Putz. Frank Klekoski married Marion Viola Bowell, daughter of George Edwin Bowell and Julia Ann Cowell, on 20 March 1902 at Lone Rock, Richland, Wisconsin. Frank Klekoski died on 14 December 1945 at age 71. 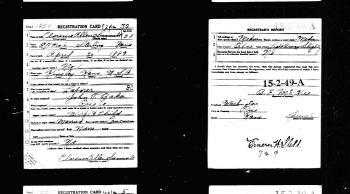 On 12 September 1918 at World War I Draft Registration, Richland, Wisconsin. [S244] U.S. Federal Census 1910 U.S. Federal Census, by Ancestry.com, ED96. Dwelling 55. [S243] U.S. Federal Census 1920 U.S. Federal Census, by Ancestry.com, ED195. Dwelling 246. Name Variation William Henry Stryker was also known as Striker. Name Variation William Henry Stryker was also known as Henry. William Henry Stryker was born circa 1850 at Pennsylvania. He married Martha Ann Gile, daughter of Benjamin Gile and Isabell Maria Tew, on 5 November 1871 at Clyde, Iowa, Wisconsin. [S247] U.S. Federal Census 1870 U.S. Federal Census, by Ancestry.com, Page 7. Dwelling 48. [S246] U.S. Federal Census 1880 U.S. Federal Census, by Ancestry.com, NA Film Number T9-1429 Page Number 25D. Married Name 5 November 1871 As of 5 November 1871,her married name was Stryker. Martha Ann Gile was born in 1853 at Clyde, Iowa, Wisconsin. She was the daughter of Benjamin Gile and Isabell Maria Tew. Martha Ann Gile married William Henry Stryker on 5 November 1871 at Clyde, Iowa, Wisconsin. George Brush Skinner married Martha Tew, daughter of James Tew and Alice Parish, on 1 January 1855 at Herrick, Susquehanna, Pennsylvania. Married Name 21 February 1881 As of 21 February 1881,her married name was Herlitz. Augusta Ricks married Ernest Herlitz on 21 February 1881 at Richland, Richland, Wisconsin. Married Name circa 1870 As of circa 1870,her married name was Shaffer. Married Name after 1910 As of after 1910,her married name was Coffin. Cassandra Clark was born in August 1853 at Indiana. She was the daughter of Uriah Clark and Elizabeth (?). Cassandra Clark married William Harold Shaffer, son of David Simon Shaffer and Elizabeth Bender, circa 1870. Cassandra Clark married Albert Roswell Coffin after 1910. Cassandra Clark died on 31 July 1920 at Medford, Jackson, Oregon, at age 66. Cassandra Clark had 7 with 6 living in 1900 children. [S246] U.S. Federal Census 1880 U.S. Federal Census, by Ancestry.com, NA Film Number T9-1445 Page Number 75A. [S245] U.S. Federal Census 1900 U.S. Federal Census, by Ancestry.com, ED61. Dwelling 37. [S244] U.S. Federal Census 1910 U.S. Federal Census, by Ancestry.com, ED107. Dwelling 293. Name Variation Orlando Burton Shaffer was also known as Orland. Name Variation Orlando Burton Shaffer was also known as O. B. Name Variation Orlando Burton Shaffer was also known as Orra. Orlando Burton Shaffer was born in December 1874 at Wisconsin. He was the son of William Harold Shaffer and Cassandra Clark. Orlando Burton Shaffer married Maggie Leona Kendall before 1901. Orlando Burton Shaffer married Fannie Dorothy Felton, daughter of (?) Felton and Alma A. (? ), on 24 October 1913 at Tripp, South Dakota. Orlando Burton Shaffer died on 19 August 1956 at Gregory, South Dakota, at age 81. [S243] U.S. Federal Census 1920 U.S. Federal Census, by Ancestry.com, Year: 1920;Census Place: Dixon, Gregory, South Dakota; Roll: T625_1719; Page: 2B; Enumeration District: 67; Image: 254. Name Variation Jennie E. Shaffer was also known as Jenna. Married Name circa 1911 As of circa 1911,her married name was Walden. Married Name circa 1911 As of circa 1911,her married name was Waldren. Married Name circa 1911 As of circa 1911,her married name was Waldon. Jennie E. Shaffer was born in November 1876 at Wisconsin also reported as South Dakota. She was the daughter of William Harold Shaffer and Cassandra Clark. As of 1910, Jennie E. Shaffer was never married. She married E. O. Walden circa 1911. Jennie E. Shaffer died after 1942. Jennie E. Shaffer lived in 1942 at Oregon. [S243] U.S. Federal Census 1920 U.S. Federal Census, by Ancestry.com, Year: 1920;Census Place: Medford, Jackson, Oregon; Roll: T625_1495; Page: 6A; Enumeration District: 483; Image: 394. [S250] U.S. Federal Census 1930 U.S. Federal Census, by Ancestry.com, Year: 1930; Census Place: Howard, Jackson, Oregon; Roll: 1944; Page: 1A; Enumeration District: 30; Image: 269.0. John H. Shaffer was born in May 1879 at Wisconsin. John H. Shaffer married Beatrice Elam, daughter of John J. Elam and Henrietta (? ), on 21 August 1913. [S243] U.S. Federal Census 1920 U.S. Federal Census, by Ancestry.com, Year: 1920;Census Place: Lake Hill, Pennington, South Dakota; Roll: T625_1725; Page: 8A; Enumeration District: 166; Image: 851. [S250] U.S. Federal Census 1930 U.S. Federal Census, by Ancestry.com, Year: 1930; Census Place: Lake Hill, Pennington, South Dakota; Roll: 2229; Page: 1A; Enumeration District: 13; Image: 652.0. John E. Sumwalt was born on 3 December 1859 at Indiana. He was the son of Joseph Langdon Sumwalt and Huldah Dugan. John E. Sumwalt married Roseletta Emsey Snyder, daughter of William Morgan Snyder and Elizabeth Jane Waggoner, circa 1889. John E. Sumwalt died on 3 September 1936 at age 76. [S248] U.S. Federal Census 1860 U.S. Federal Census, by Ancestry.com, Dwelling 114. [S247] U.S. Federal Census 1870 U.S. Federal Census, by Ancestry.com, Page 29. Stamp 297. Dwelling 249. [S246] U.S. Federal Census 1880 U.S. Federal Census, by Ancestry.com, NA Film Number T9-0306 Page Number 56D. [S245] U.S. Federal Census 1900 U.S. Federal Census, by Ancestry.com, ED274. Dwelling 49. [S244] U.S. Federal Census 1910 U.S. Federal Census, by Ancestry.com, ED183. Dwelling 20. [S243] U.S. Federal Census 1920 U.S. Federal Census, by Ancestry.com, ED189. Dwelling 238. [S250] U.S. Federal Census 1930 U.S. Federal Census, by Ancestry.com, ED78-45. Dewlling 369. Name Variation Roseletta Emsey Snyder was also known as Emsey Roseletta. Name Variation Roseletta Emsey Snyder was also known as Rose. Name Variation Roseletta Emsey Snyder was also known as Rosie. Married Name circa 1889 As of circa 1889,her married name was Sumwalt. Roseletta Emsey Snyder was born on 22 April 1868 at Moultrie, Illinois, also reported as May 1869. She was the daughter of William Morgan Snyder and Elizabeth Jane Waggoner. Roseletta Emsey Snyder married John E. Sumwalt, son of Joseph Langdon Sumwalt and Huldah Dugan, circa 1889. Roseletta Emsey Snyder died on 17 June 1949 at Dalhart, Dallam, Texas, at age 81 also reported as 1950. Roseletta Emsey Snyder had 4 with 4 living in 1910 children. [S246] U.S. Federal Census 1880 U.S. Federal Census, by Ancestry.com, NA Film Number T9-0375 Page Number 139A. Clarence Allen Sumwalt was born on 30 April 1889 at Kinsley, Kansas. He was the son of John E. Sumwalt and Roseletta Emsey Snyder. Clarence Allen Sumwalt married Mary (?) before 1917. Clarence Allen Sumwalt died in June 1976 at age 87. Clarence Allen Sumwalt obtained US Social Security Card at Wisconsin; last residence Madison, Dane, Wisconsin. 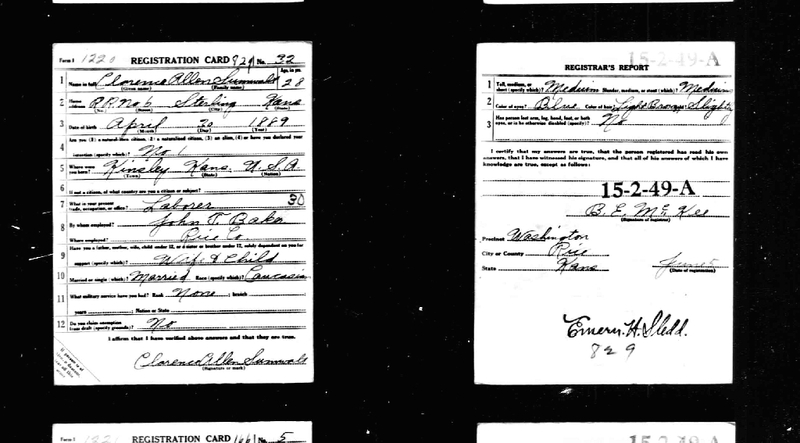 On 5 June 1918 at Rice, Kansas, World War I Draft Registration. [S243] U.S. Federal Census 1920 U.S. Federal Census, by Ancestry.com, ED205. Dwelling 101. Name Variation Floyd Albert Sumwalt was also known as Floyd M.
Floyd Albert Sumwalt was born on 5 September 1890 at Leon, Kansas. Floyd Albert Sumwalt married Lydia Catherine Kittle, daughter of Silas Milton Kittle and Elizabeth Luiza Isable, on 17 July 1915 at Nickerson, Reno, Kansas. Floyd Albert Sumwalt married Viola (?) before 1923. 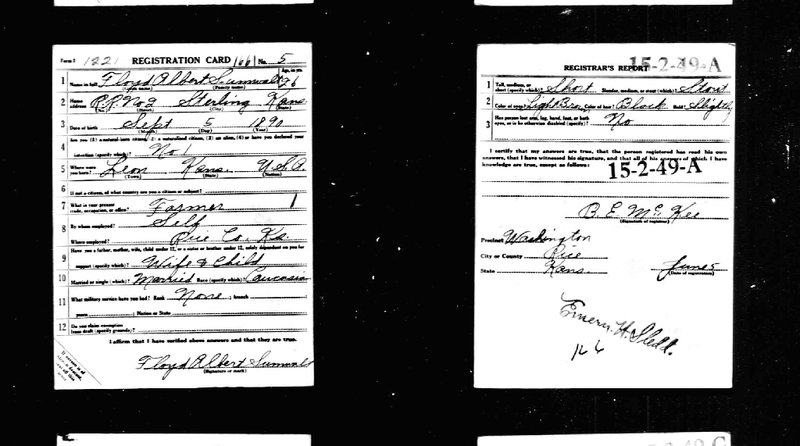 On 5 June 1918 at Rice, Kansas, World War I Draft Registration. [S243] U.S. Federal Census 1920 U.S. Federal Census, by Ancestry.com, ED205. Dwelling 107. [S250] U.S. Federal Census 1930 U.S. Federal Census, by Ancestry.com, ED78-33. Dwelling 119. Married Name circa 1920 As of circa 1920,her married name was States. Mary Elizabeth Sumwalt was born on 18 November 1900 at Kansas. She was the daughter of John E. Sumwalt and Roseletta Emsey Snyder. Mary Elizabeth Sumwalt married Ernest Franklin States, son of Edward States and Carrie M. Lehman, circa 1920. Mary Elizabeth Sumwalt died on 7 December 1988 at age 88. Mary Elizabeth Sumwalt obtained US Social Security Card at Texas; last residence Dalhart, Dallam, Texas. [S250] U.S. Federal Census 1930 U.S. Federal Census, by Ancestry.com, ED56-3. Dwelling 216. Ernest Franklin States was born on 30 October 1898 at Kansas. He was the son of Edward States and Carrie M. Lehman. Ernest Franklin States married Mary Elizabeth Sumwalt, daughter of John E. Sumwalt and Roseletta Emsey Snyder, circa 1920. Ernest Franklin States died in August 1981 at age 82. Ernest Franklin States obtained US Social Security Card; Long-time or retired railroad workers; last residence Dalhart, Dallam, Texas. [S245] U.S. Federal Census 1900 U.S. Federal Census, by Ancestry.com, Year: 1900; Census Place: Grant, Reno, Kansas; Roll: T623_496; Page: 11B; Enumeration District: 196. [S243] U.S. Federal Census 1920 U.S. Federal Census, by Ancestry.com, Year: 1920;Census Place: Enterprise, Reno, Kansas; Roll: T625_546; Page: 4B; Enumeration District: 163; Image: 137. Married Name 17 July 1915 As of 17 July 1915,her married name was Sumwalt. Lydia Catherine Kittle was born on 3 September 1896 at Rush, Kansas. She was the daughter of Silas Milton Kittle and Elizabeth Luiza Isable. Lydia Catherine Kittle married Floyd Albert Sumwalt, son of John E. Sumwalt and Roseletta Emsey Snyder, on 17 July 1915 at Nickerson, Reno, Kansas. Lydia Catherine Kittle died on 12 June 1920 at age 23. [S245] U.S. Federal Census 1900 U.S. Federal Census, by Ancestry.com, ED237. Dwelling 40. [S244] U.S. Federal Census 1910 U.S. Federal Census, by Ancestry.com, ED157. Dwelling 25. Name Variation Lucille Mary Sumwalt was also known as Mary Lucille. Married Name 2 September 1938 As of 2 September 1938,her married name was Greenfield. Lucille Mary Sumwalt was born on 25 December 1917 at Nickerson, Reno, Kansas. She was the daughter of Floyd Albert Sumwalt and Lydia Catherine Kittle. Lucille Mary Sumwalt died on 30 December 2003 at Hutchinson Hospital, Hutchinson, Reno, Kansas, at age 86 Lucille Greenfield, 86, died Dec. 30, 2003, at Hutchinson Hospital. She was born Dec. 25, 1917, at Nickerson, the daughter of Floyd and Lydia Kittle Sumwalt. She was also the stepdaughter of Viola Sumwalt. A lifetime Reno County resident, she had worked in the Cary Salt Dairy Packaging Department for 28 years, retiring in 1981. She belonged to the Carey Salt Retirees Breakfast Club. On Sept. 2, 1938, she married Marion M. "Bill" Greenfield at Hutchinson. He survives. Other survivors include: a son, Billy Joe, Ponca City, Okla; a daughter, Pamela Faye Polk, rural Burrton; two brothers, Kenneth, Stoughton, Wis., and Doyle, Lebanon, Mo; three sisters, Juanita Methews, Mojave Desert, Ariz., Vera Ray, Hutchinson and Rosalee Bontrager, Hutchinson; six grandchildren; 15 great-grandchildren; and a great-great-grandchild. She was preceded in death by three sisters, Imajewel Bringle, Haney Teter and Irma O'Shea. Funeral will be at 2 p.m. Friday at Elliott Chapel, Hutchinson, with Bill Greenfield presiding. Friends may call from 9 a.m. to noon Friday at Elliott Mortuary, Hutchinson. Burial will be in Fairlawn Burial Park, Hutchinson. Memorials may be sent to American Diabetes Association, in care of the mortuary.